The report examined companies by revenue range in order to show how different companies of different sizes award compensation. Overall, GC compensation increased substantially across all revenue buckets in the Equilar 500, with the exception of the $5-10 billion revenue group. The median total compensation of Equilar 500 GCs at companies with revenue greater than $20 billion was $4.5 million, almost $2 million more than the median GC pay at companies with revenue between $10 and $20 billion. 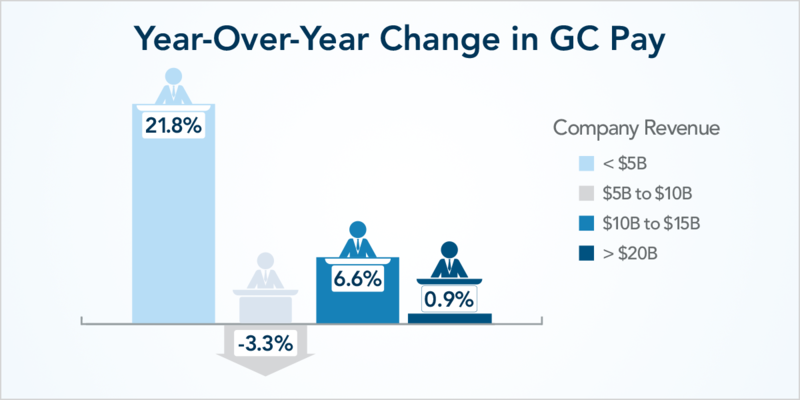 The median compensation for GCs at companies with revenue between $5 and $10 billion saw a 3.3% decrease in the total compensation of its GC from 2016 to 2017. In contrast, the median at companies with revenue less than $5 billion saw a year-over-year growth of almost 22%. In comparison to CEO pay, CEOs at companies with revenue between $10 and $20 billion made 4.6 times the total compensation of the median GC, the highest in the study. Perhaps not surprisingly, the smallest difference between the compensation of the median CEO and the median GC can be seen in companies with revenues less than $5 billion, where the CEO made just 3.1 times the total compensation of the GC. As GCs continue to gain a seat in the C-suite, their level of prominence among executive management teams becomes greater. Consequently, top officers look for high quality candidates when it comes to filling the GC postion. On average, more than a third of General Counsel compensation at large companies with over $20 billion in revenue was comprised of performance incentives. Comparatively, the smallest companies in the study—those with less than $5 billion in annual revenue—had performance incentives make up less than a quarter of average GC pay. Long-term incentive compensation most often took the form of performance stock, with an average usage of 81.7% of companies across all revenue ranges granting such awards. More than twice as many Equilar 500 companies used relative total shareholder return (TSR) as a metric in long-term incentive plan (LTIP) grants to General Counsels than return on capital/return on invested capital/return on equity (ROC/ROIC/ROE), the second-most commonly used metric. Click here to request a download of the full report. General Counsel Pay Trends, an Equilar publication, analyzes the compensation of General Counsels (GC) disclosed in the SEC filings by Equilar 500 companies for the fiscal years of 2016 and 2017. The Equilar 500 is comprised of the 500 largest, by reported revenue, U.S.-headquartered companies that trade on one of the three major U.S. stock exchanges (Nasdaq, NYSE or NYSE American), with adjustments to compare to the sector mix of similar large-cap indices. Fiscal year one was defined by companies that filed proxy statements from July 1, 2017 to June 30, 2018, and earlier years were defined similarly. The hard measures of our operational efficiency keep existing clients returning to the firm and provide our new clients with the peace of mind of knowing the success of their search is inevitable. Our industry leading, audited metrics over the past three years include: a 96% retention rate of placements made, 44% of which are women, 24% ethnically diverse, a 96-day average timeframe to execute a search, and guaranteed results. www.barkergilmore.com.